Normally I don’t read the news because it’s often so negative and I like to stay positive and full of faith. 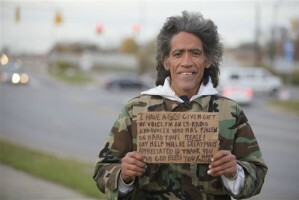 But the story of homeless man Ted Williams with the “golden voice” caught my ear this morning from K-Love radio station. There’s been supposedly 3 million views of him on YouTube since the Columbus Dispatch posted a video (see Associated Press video below) of him on the web earlier this week. According to Fox news, he’s now been offered a job by the NBA’s Cleveland Cavaliers, and is being pursued by NFL films and others for possible work. He became an overnight star when the Columbus Dispatch posted the clip of him demonstrating his voiceover skills while he was begging by the side of the road with a sign for help. I often wonder how homeless people wind up on the streets. Ted became homeless after his life was ruined by drugs and alcohol, and his past has a long list of arrests. He’s been in prison several times for theft and forgery with numerous citings for misdemeanors including drug abuse, according to Fox news. On The Early show, he said he had been sober now 2 1/2 years. Ted admitted his criminal record during the Today show appearance, saying that he turned to crime to support his drug habits. When they learned about his criminal history, the Cavaliers said their offer still stands, Fox news said. “We believe in second chances and second opportunities. The gentleman deserves an opportunity to explain certain situations. We’re not jumping to conclusions. It’s not fair,” said Tracy Marek, the team’s senior vice president of marketing. When he was interviewed on The Early Show show, he talked about being very thankful to God for his second chance and began to cry as he spoke about going to see his 90-year-old mother Julia , who he hasn’t seen in a long time. She lives in Brooklyn and he says she has stood by him through his addictions. Some comments left on YouTube are pretty nasty about Ted’s story, saying things like, why should anyone give a drug addict a job? You know, the God I serve has given me not only a second chance in life, but many chances. His mercies are new every morning. I think this is an incredible story of God’s love and grace. I am praying for Ted, that the sudden rise to fame will not cause any sort of relapse for him and that his life will truly be turned around with an incredible job, a home, new godly friends, and a new church home. I pray that he will indeed become “God’s voice” of redemption to mankind. None of us deserve a second chance – but God desires to give us one, through the power of Jesus’ redeeming blood and God’s forgiveness. What are your thoughts on this story? Leave your comments below the video. Ted, I am praying for you. I think your story is amazing and am rooting for you all the way. And you have a great voice!